The world has focused on Debussy and Bernstein to celebrate their anniversaries, but I haven't seen anything about Bantock, who would be 150 years old this year. This composer is special to me because of his extremely fine craftsmanship on A Celtic Symphony. Works in a similar vein would be the Vaughan Williams' Fantasia on a theme by Thomas Tallis, Tippett's Fantasia concertante on a theme by Corelli and Alwyn's Lyra Angelica. I'm in love with the Celtic, one of my last pieces when dying (and I'm not exaggerating ). Some suggestive titles just sound fascinating, so, what are, you labels, waiting for? Yes, Happy Birthday from me too. The Celtic Symphony was performed at the Proms a few years ago (actually 2013 - just checked). I was fortunate enough to be there and saw and heard all those harps! I went though a Bantock phase a few years ago and bought several of the Hyperion releases including the complete Omar Khayyam. I found the results mixed; I enjoyed each piece as I listened to it but didn't find anything (with one exception) particularly memorable. Perhaps it all needs revisiting. The exception is the Celtic Symphony which really is beautiful; I think it is the sort of thing Classic FM would take up and flog to death. I agree about the Celtic Symphony but also like the Hebridean and Pagan symphonies. A Celtic Symphony has a special place in my heart. It's one of those things you can't forget once heard. It's a dream of mine, attending a performance of this work at least once. The rest of his symphonies is very fine, too, but not as memorable as the Celtic. I agree with previous posters that the Celtic Symphony is especially beautiful. The Hebridean Symphony and The Witch of Atlas are both atmospheric and superbly orchestrated but rather less memorable. The big surprise on the disc was the 3 1/2 minute Hebridean Sea Poem No. 2: The Sea Reivers, a scherzo-like work with builds up an impressive head of steam to a riveting ending. I wish it were longer! If you're going to have only one Bantock CD that is the one to have Kyle! The Sea Reivers was originally intended to be part of the Hebridean Symphony. The Symphony is without question my favourite work of Bantock's. 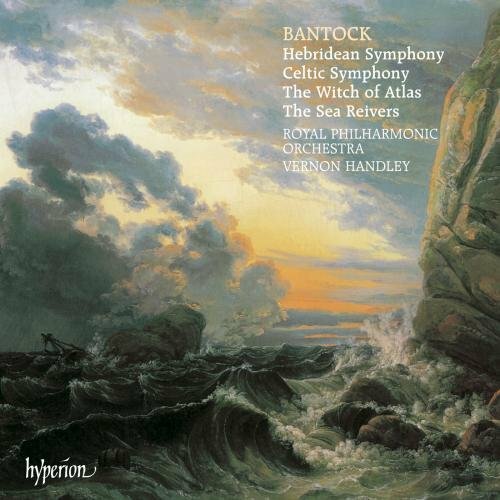 The Hebridean is a fine work and, along with the Celtic Symphony, my favourite of Bantock's works. I also like the Pagan Symphony. Thalaba the Destroyer was the first work of Bantock's I got into. It's an epic work, worthy to be alongside the "heroic" B minor symphonies by Tchaikovsky ("Manfred") and Gliére ("Il'ya Muromets"). The only disc of the Hyperion series I've yet to pick up is Sappho/Sapphic Poem. 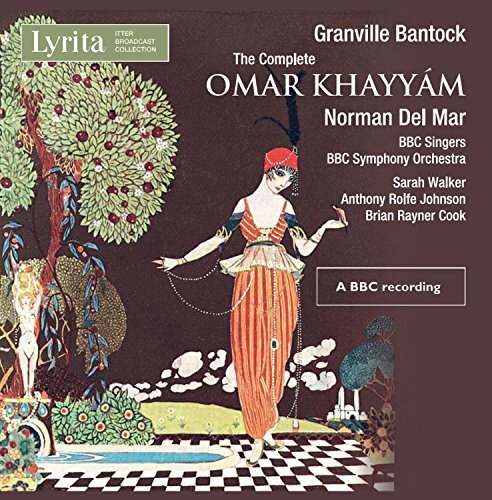 I'd also like to get the Lyrita recording of Omar Khayyam, as that is the complete rendition of the work, unlike the cut Chandos recording. I quite like Symphony 3 'The Cyprian Goddess' as well. Oh yes! Another fantastic work I've discovered in recent months. Also, I need to give Symphony No. 3 another go. It's been a little while. Part III of Omar Khayyám; Fifine at the Fair (tone poem for orchestra after Robert Browning); Sappho, songs for contralto and orchestra (6 out of a cycle of 9); The Pierrot of the Minute, a « comedy overture ». This completes my Bantock Project for this year. In 2017 I delved into the 6 discs Hyperion set of the tone poems and symphonies. At first that had seemed to me rather daunting, but the music is so consistently fine and original that I was thrilled to have added that set - and composer - to my collection. Bantock’s imagination seems to know no bounds, finding fertile ground in all kinds of tales and legends. So, moving from there to the more arcane and even more daunting Omar Khayyám seemed lime the logical next step. While listening to the first part (93 minutes of music) I thought that it might have been a good idea for Bantock to arrange some kind of digest - say, 45 minutes - of his music. Bantock did indeed arrange bits and parts into other musical formats, but it didn’t help arouse interest for the complete work. But persevering paid off handsomely, the music proving extremely rewarding, its inspiration constantly renewed and the cumulative effect proving quite addictive. 101 quatrains and 3 hours of nonstop singing is indeed quite a lot to swallow in one sitting. It’s not like there is any narrative continuity to the stanzas of Edward Fitzgerald’s poems. The fascinating booklet notes describe the huge popularity and influence of this collection. It was even printed in cheapo paperback editions for mass consumption. But eventually the novelty effect of this literary exotica faded and it became increasingly difficult to sell Bantock’s Omar Khayyám to the listening public, although it had some ardent advocacy from Havergal Brian, Ernest Newman and Henry Wood. Bantock died in 1946 and it fell to his wife Helena (cf. the Helena Variations) to keep the flame flickering. Bantock’s Omar was completed in 1909. It enjoyed a modest popularity but, due to changing tastes and the difficulty of mounting a complete performance, it ceased to be performed after 1931. The BBC producer Michael Pope developed a lifelong fascination with Bantock’s Omar. He ceaselessly petitioned for a performance and broadcast of the complete work. It took him 11 years to see his wish come true. In 1979 this BBC production was broadcast and recorded with Norman del Mar and the fine singers listed above. I can certainly imagine a better recorded version, but what we have here is very decent broadcast stereo. The singing could hardly be bettered, I think, particularly the plangent and sweet tenor of Anthony Rolfe Johnson. The main offering is then followed by a performance of Bantock’s Robert Browning fantasy Fifine at the Fair (what a whacko title!). It just so happens this is my 3rd Fifine, after Handley’s and one by Beecham. Very nice music. There follows a 3/4 complete version of Bantock’s Sappho fragments (43 minutes). The orchestral prelude and 6 songs are recorded. Del Mar is at the helm again and we hear the deep, deep voice of contralto Johanna Peters. I found the music here absolutely gorgeous. The whole set, lasting about an hour, has been recorded on Hyperion. I must explore that. Finally, Bantock in light music vein: The Pierrot of the Minute comedy overture depicts the dream adventures of a character who falls asleep in a park next to a statue of Cupid. Cute stuff, and a nice send-off to a superb set of music by this most imaginative composer. Great analysis Andre and very helpful. Encourages me to listen to a set I purchased ages ago!